The Aragorn and Brego horse and rider set is perhaps the most recognisable horse and rider set produced. Viggo actually spent some evenings sleeping in the stable with (Uraeus) Brego to form a deep, trusting relationship. As such Viggo was able to get Uraeus to kneel for him, a special scene that appears in the Two Towers. 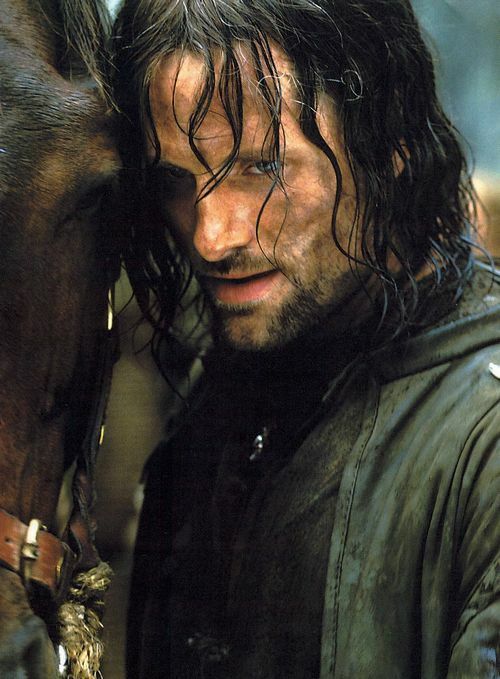 Viggo created such a bond with Uraeus that he actually bought the horse. So Uraeus was actually living on Viggo's ranch in Idaho (along with TJ, the horse he rode in 'Hidalgo'). We have since heard that Uraeus has sadly passed on. Rest in deep peace, dear noble steed. Isn't the above truly beautiful. It goes a long way to explain how all the magnificent effects and deep bonds made for a true trilogy masterpiece.